First, I added your blog to my feed reader! My favorite children's book about a garden is THE GARDENER, written by Sarah Stewart and illustrated by David Small. It's the story of a girl who is sent to live with a grumpy uncle who owns a bakery during the depression. She brings seeds with her, and during her stay plants a beautiful garden on the roof of her uncle's building. The illustrations are gorgeous and the story is heartwarming. This sounds like such a fun book! We have a very large garden out back and the kids just love to help with it! It's their excuse to get muddy and not get in trouble!! And here's the link to my post mentioning your giveaway. This one sounds so good!!! My favorite garden book is Mrs. Spitzer's Garden. It is such a sweet story with a great message. Thanks for a great giveaway, as usual! My favorite garden was ours last year. My son helped plant and he loved watching everything grow. We grew our very first watermelons! My favorite garden is my own..I have roses all summer and in the spring large bunches of yellow and red tulips and cluster daffodils that smell heavenly. And in my backyard we have our home garden-veggies and fruits-I love watching it grow. A wonderful middle-level book dealing with a community garden is called SEEDFOLKS by Paul Fleishman. Simple story; simple lesson. I've been looking forward to reading this book. Sounds like a good book! We're big gardeners. My favorite garden was my grandmother's. She had an amazing green thumb and could get anything to grow. So many great memories of walking around her yard and seeing her handiwork year after year. I also blogged about the contest! The Carrot Seed is one of my favorite gardening books: short and sweet. Thanks for the give away! My favorite garden is at a place by my house, called Thanksgiving Point. They have a tulip festival going on right now and the tulips are gorgeous! my favorite garden was at my friend's mom's house. it had a secret sitting area in the center of it. when you were sitting there you couldn't see anything but the garden. it was so peaceful and beautiful - the perfect spot! What a great giveaway. I love the book Linnea in Monet's Garden--beautiful pictures. We love The Carrot Seed! Thanks for the chance to win! My favorite garden is from my childhood. It was my grandmothers garden. I planted, and dug, and ate the fruits of her garden for years. I would love to someday cultivate what she had in her garden, both physically and emotionally!! Our favorite garden is in our backyard:) My 3 yr old loves to check our veggies every day to see their progress:) This sounds great! Thanks! My Uncle was a farmer and he had the most amazing garden ever! He planted all kinds of vegetables and tended it so it was always perfect looking AND we always got to sample! My favorite garden is Leu Gardens which is a quick 5 minute walk from my home in downtown Orlando. I can forget about everything there. Even though it's in the middle of the city it is quiet and beautiful! My favorite book about a garden is Skating Shoes by Noel Streatfeild. As you may recall, Harriet's brother earns the money for her skating lessons and all leftovers go toward his dream of a market garden. This book sounds beautiful! 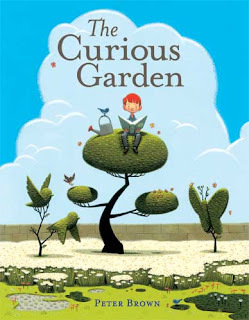 Our favorite garden book is "What's This? A Seed Story," by Caroline Mockford, and published by Barefoot Books. (shameless plug -- I sell Barefoot Books, too! You can see my blog for the banner on the side!) It's a great simple story that my 3 1/2 year old calls "the story about a girl who grows a flower." And because of reading it, she now wants to plant a sunflower garden this summer! Cute! Oh, and for the extra entry, I'm already a subscriber through bloglines. Thanks!! oops -- I forgot to leave my e-mail. I'm not much of a gardener but this spring, my 3 yr. old son and I are going to plant a garden. I'm going to let him choose the plants - we'll maybe do a planter box of flowers and another of veggies (he LOVES tomatoes). I think this will be my favorite garden. I keep seeing this at the checkout line at Wegman's and I'm trying to hold off on buying it! Definitely would love to add this to my spring collection! Besides our own garden, my favorite garden is the Botanical Gardens in San Antonio, Texas. My favorite garden is of course our own :) But I'm also loving yours! We'd love to have more space. Will try blog and return with a url later. my favorite book about a garden would be "The Secret Garden"
My favorite garden is the one we had every year growing up. We had a huge backyard and our relatives would all get together to plant the enormous garden and we all shared the veggies. That was a great memory. Thank you! Would love to win this for the grandsons. I haven't been too successful with a garden here in TX due to the over population of the deer. I tried when we first moved here but they eat everything as soon as it blooms. Thanks for having the wonderful giveaway. My grandmother had a lovely garden. She also did all the canning of vegetables from the garden. This where I first learned to garden and can. I think she was my first inspiration. I love the local public flower garden here. It's so pretty and nice to walk through when everything is blooming. My mom's garden is my favorite. She has plants that belonged to each of my grandmothers moved from their homes, to her home, and now to her new home! She is a great gardener! I'm thinking about the peter rabbit childrens book. Such a classic favorite! My favorite children's book about a garden... well actually my FAVORITE book of all time, which happens to be about a garden is "The Secret Garden" I still have the dog-earred copy of this book that was given to me by my mother and will pass it down to my daughter, whom I hope will love it just as much as I do! One of my favorite children's book is The Three Little Pigs. We love Muncha! Muncha! Muncha! Such a cute books. My favorite garden is in Indiana, in my hometown, where I was raised. My children loved there until they were 12, 10 and 5 years of age and we visited each summer thereafter. They loved playing in the garden, picking the veggies for harvest and especially eating the raspberries & blackberries right off the vine. I subscribe via Google Reader and also on Twitter. My favorite children's book about a garden would have to be The Secret Garden! My favorite garden is my husband's grandfather's. He grows the biggest blackberries I've ever seen! My favorite story is The Secret Garden. Thanks for the giveaway. This sounds like a great book. My favorite garden is the one that we just planted! We tried last year but nothing grew! I love vegetable gardens! I enjoy seeing the fruits of my labor and there's nothing like to eat food you've grown yourself and being able to share it with friends, family, and neighbors! Favorite garden is when we planted with the kids. My favorite garden was my mom's. She used to have a huge garden every year, including fresh okra( my favorite,) and all the ingredients for homemade salsa. My favorite garden book is a childhood memory - "Seeds and More Seeds". It was an I Can Read Book, but looking back, it was very well done. I love my community garden, it's so much fun! My favorite garden is my parents. They go all out -- flowers, veggies -- its great. My favorite garden is my mothers garden. It has a nice variety of colorful flowers and beautiful trees. It is a very relaxing getaway. The gardens of Versailles in Paris are absolutely exquisite! Nothing like them. My favorite garden was my Grandmother's. She had the most beautiful roses and flowers. I love my papaws garden... growing up... meeemories!! My favorite garden was the one we had growing up - we grew green beans, strawberries, carrots, radishes. My favorite garden is my mother's. It is very natural, cool, and shady. I will always aspire to have a garden like hers! when I was very small my father tended a garden in a vacant lot across from my grandma's house. I remember burying fish for fertilizer and growing the sweetest little yellow pear tomatos you ever tasted. I always have a garden now, and I love those memories. Even though we lived in the city when I was growing up, our street was lined with Chestnut trees. It was so beautifl. The city came in and "chopped" these beautiful living trees down to widen the street for cars. Please enter me in the giveaway. My favorite garden is my own. Each year I like to plant at least one new variety of flower. My favorite garden is the one I have in my mind to do at my house one day. We just haven't been able to yet. I would love to have fresh tomatoes for a salad! Thank you for the giveaway. My favorite garden book is "how to have a green thumb without an aching back" by Ruth Stout. We saw the gardens built by Catherine the Great at the Winter Palace in St. Petersburg, Russia. They were amazing. My favorite is Growing Vegetable Soup by Lois Ehlert. "The Secret Garden" is my favorite unless you count "Jack and the Beanstalk". Hey, I'd love to grow beans that big! My favorite book about a garden is The Secret Garden. It had such mystery. I have read the secret garden to my girls and they loved it.I did too at thier age.Thanks! Our favorite garden is the Kingwood Center in Mansfield Ohio, It is absolutely beautiful. In the Spring, the massive amounts of Tulips, and Daffodils are amazing. Beautiful place. Thanks for the chance at the giveaway. WE love books! I always loved the book The Secret Garden! I'm curious about what makes a book "golden" to a young child. I had a teacher in the third grade who read us, at lunchtime, "The Secret Garden". I was enthralled, as were all the children in the class, and couldn't wait for the morning to be over. I'd love to be able to WRITE a book like that, and am curious about how to get started. plytle1 at comcast dot net.